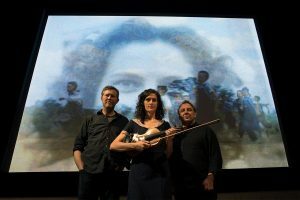 Accompanied by Jenny Scheiman on the violin, Robbie Fulks on the banjo, and Robbie Gjersoe on the guitar, Kannapolis: A Moving Portrait is a multimedia performance set against the movies of H. Lee Waters, who documented more than 118 small towns in the American southeast between 1936 and 1942. The score is originally composed by Sheinman, a testament to her dedication and passion for capturing the essence of the time period. Scheinman and filmmaker Finn Taylor painstakingly reedited Waters’ images to Scheinman’s music, creating a new movie that speaks to any community as much as to the towns where it was filmed. The history behind the film is fascinating. All of the “characters” are just regular people living their lives. Waters would record the locals and then show his work in the local theater so that the people could watch themselves on the big screen. Waters also played around with his recordings; making his images run in reverse backwards and creating other editing illusions with the camera. What makes this compilation so unique is that film is able to capture the life and character of the locals better than still photography. The combined score and imagery spark a deeply evocative emotion that can’t really be summarized in a single phrase. It’s a realization that each random passerby is living a life as vivid and complex as your own. You feel nostalgia for a past you personally never experienced. You see yourself in the laughter and affectionate glances between the people on screen. It’s a cross between yearning and understanding; not so much a desire to live in the past, but for human engagement and community.